Eaton's Anna Black dribbles the ball during the Eagles basketball game with Franklin on Thursday, Jan. 24. Black scored five points, but the Eagles came up short, falling 56-37. Preble Shawnee’s Brenna Woodard drives to the basket during the Arrows basketball game with Twin Valley South on Saturday, Jan. 26. Shawnee won the game 62-26. 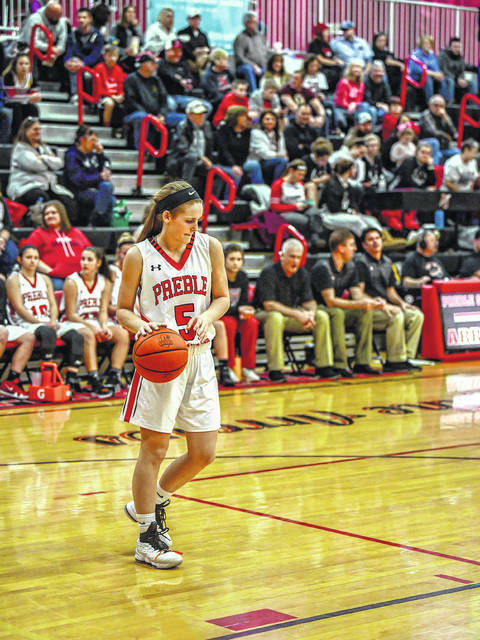 PREBLE COUNTY — Preble Shawnee’s girls basketball team ran its winning streak to five with a pair of wins last week. 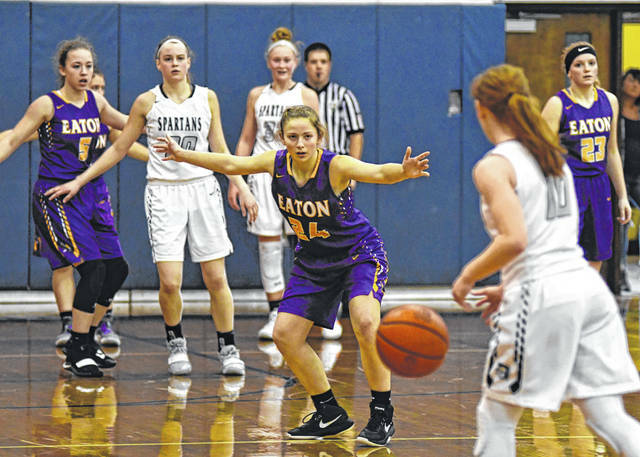 The Arrows, now 11-5 overall and 8-1 in the Southwestern Buckeye League Buckeye Division, picked up wins over Middletown Madison (49-41) and Twin Valley South (62-26). 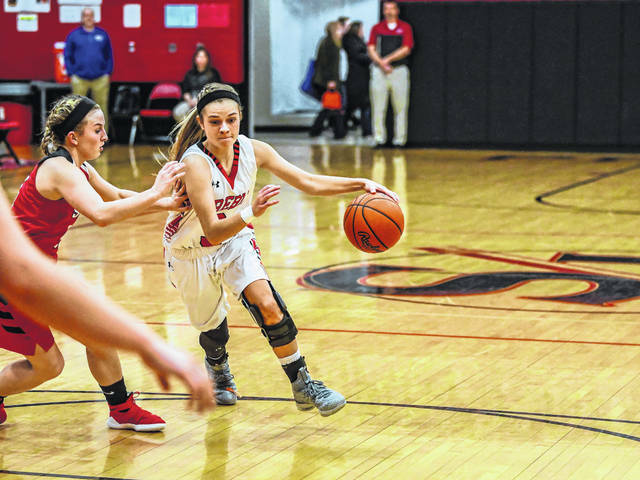 Against Madison, on Thursday, Jan. 24, Jenna Lovely led the way with 20 points, five rebounds, five steals and three assists. Brenna Woodard added 15 points, five assists, three rebounds and two steals. Nicole Sims tossed in 10 points. She also had three rebounds and two assists. The Arrows trailed 14-9 after one quarter, but rallied to take a 28-26 halftime lead. Shawnee extended its lead to 36-32 after three. 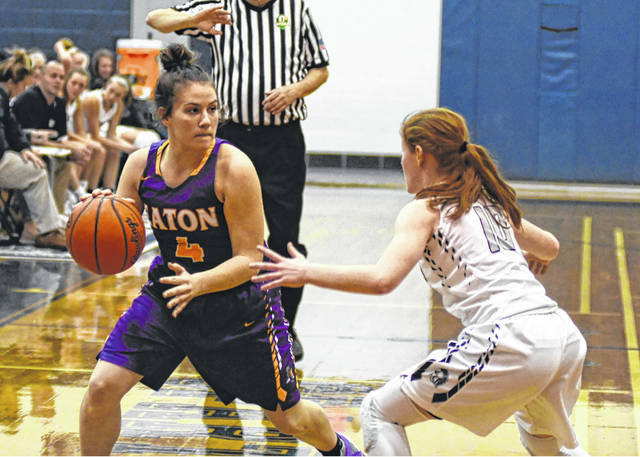 Against South, on Saturday, Jan. 26, the Arrows soared to a 16-1 lead after one quarter and led 34-9 at the half. Lovely had another solid night, scoring 20 points. She added three rebounds and two steals. Woodard tossed in 14 and grabbed six rebounds. She also had five assists and four steals. Sims contributed 11 points, four rebounds, five assists and two steals. Logan Hollon chipped in with seven points and pulled down a team-high 11 rebounds. She also contributed four assists, three steals and a pair of blocked shots. The Arrows are scheduled to return to action on Saturday, Feb. 2 when they are to host Northridge. 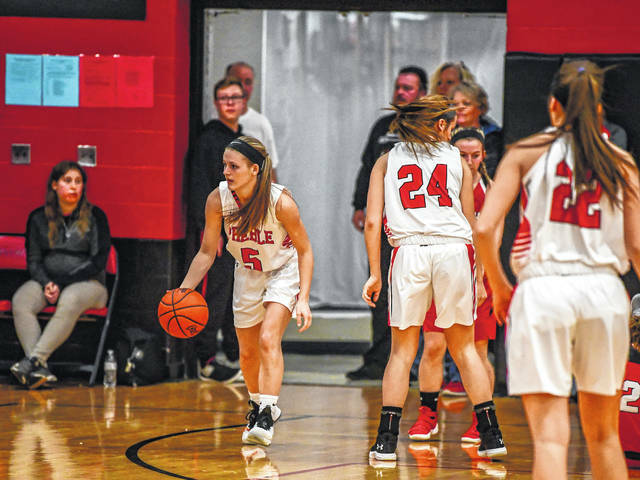 They will meet Fenwick on Monday, Feb. 4, at home and will host Waynesville on Tuesday, Feb. 5, in a battle for the top spot in the league. 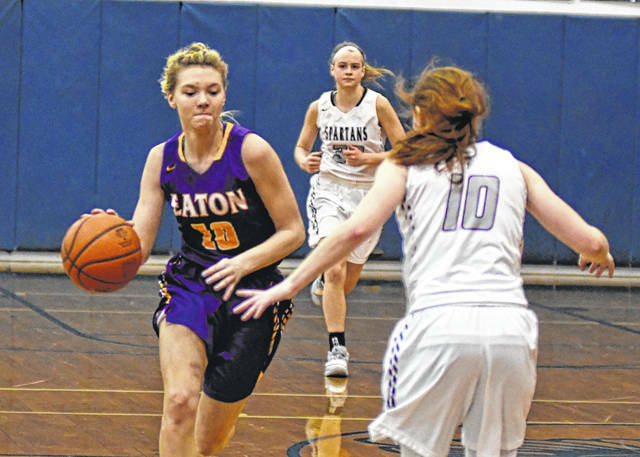 Eaton continued its run against the SWBL Southwestern Division’s top teams last week as it played league-leader Franklin and second place Valley View in a three day span. 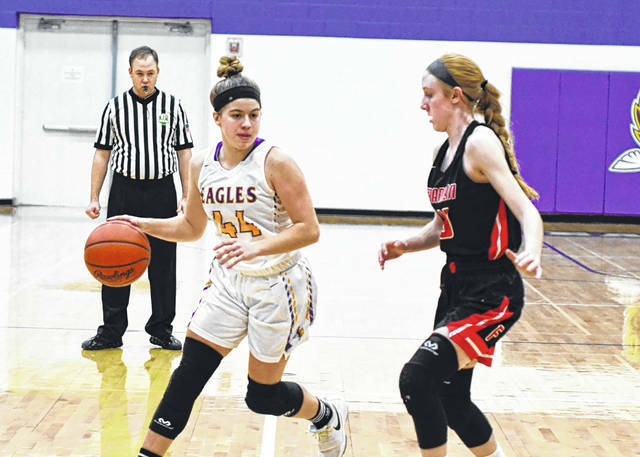 The Eagles dropped both contests, falling to visiting Franklin 56-37, and at Valley View 59-27. “I appreciate just how hard our players play on defense. 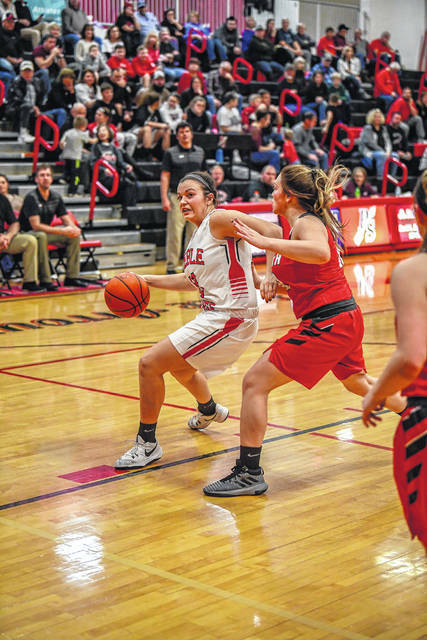 When I watch us on film after the game, it reminds me just what a special group these players have become in terms of their collective effort at the defensive end,” Eaton coach Dave Honhart said. Honhart said his team need to improve on it ball-handling. He said he was proud of the effort his team gave. He said he used the game as a chance to get some playing for some junior varsity players at the varsity level against a high caliber team. 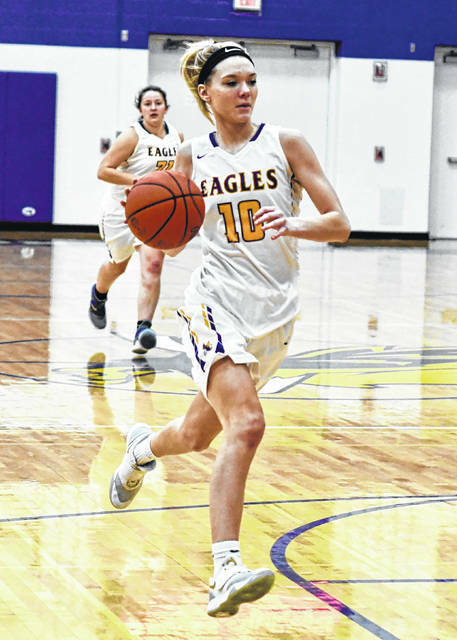 Bailey Shepherd and Becca Mowen led the Eagles with seven points each. Mowen also added seven rebounds. Lexi Miller tossed in four points and had five rebounds. Ashley Earley and Anna Black each scored five. Against Valley View, the Eagles got off to slow start and never recovered, falling behind 23-4 early in the second quarter. “Give Valley View a lot of credit. They defend extremely well, they shoot it extremely well and they are a great passing team. it is very clear they don’t care who gets the points – when you have that approach and that kind of talent it makes them a really tough opponent,” he said. 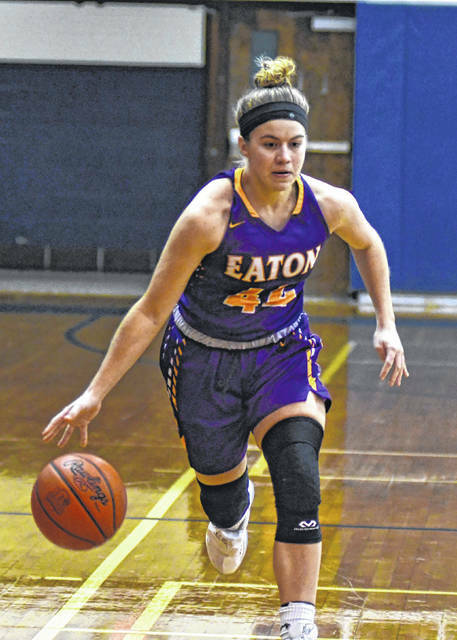 Becca Mowen and Miller each scored six to lead Eaton. Miller also had three rebounds and two steals. Earley tossed in four and had five rebounds. Gels tallied five points. 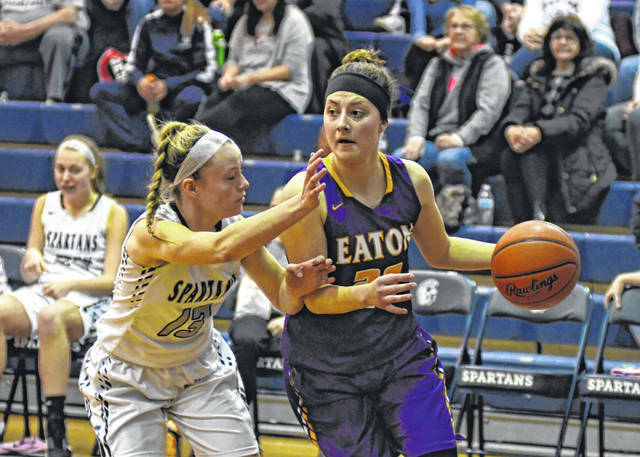 Eaton (6-11, 2-9 SWBL Southwestern) is scheduled to play a pair of road games this week as they are scheduled to play at Talawanda on Wednesday, Jan. 30 and Edgewood on Thursday, Feb. 1. “We’ve had good games with both schools in the past and we look forward to resuming those rivalries,” Honhart said. National Trail played a solid game and came away with a 55-39 win over Ansonia on Thursday, Jan. 24. Makena Laird had a big night leading the team with 23 points. Skyler Ward and Savanna Abner both reached double figures as well with 12 and 10 respectively in a nice offensive showing. The team was pretty stingy on defense most of the night and had great performances throughout the team, according to Trail coach James Byrd. The JV team won a close game as well 35-34. Ryleigh Minner was the offensive catalyst the entire game. The Blazers were scheduled to host Dayton Christian on Tuesday, Jan. 29 and are to visit Bethel on Thursday. 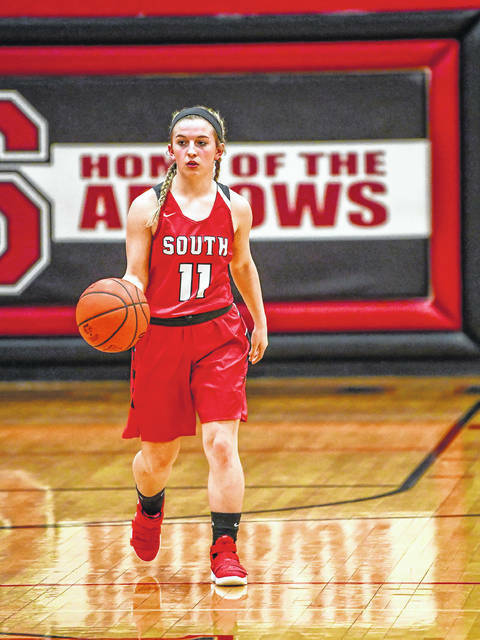 Twin Valley South had a rough week as the Panthers fell to Dayton Dunbar, Newton and Preble Shawnee to see its record fall to 7-11 overall and 2-7 in the Cross County Conference. The Panthers began the week with a 44-42 loss to Dunbar on Tuesday, Jan. 22. Taylor Bowers and Madison Johnson each scored 11, while Mackenzie Neal had 10. Neal also added 12 rebounds for her first double-double of the week. Taylor Clark grabbed eight rebounds and Bowers added seven. 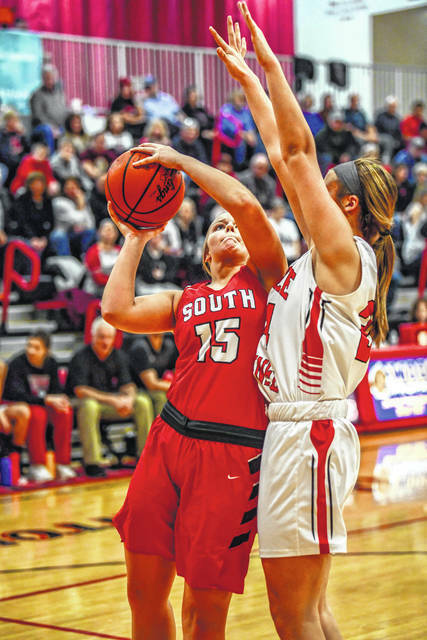 Against Newton, on Thursday, South trailed 17-6 after one and closed to within a point after three 32-31. The Indians outscored South 18-9 in the fourth to secure the win. Neal led the way with 13 points and 13 rebounds. Johnson added eight and Taylor Bowers contributed six. Clark grabbed 10 rebounds and blocked two shots. Against Shawnee, South fell behind 16-1 after the first quarter and never threatened the host Arrows. Neal led South with 13 points and 12 rebounds. 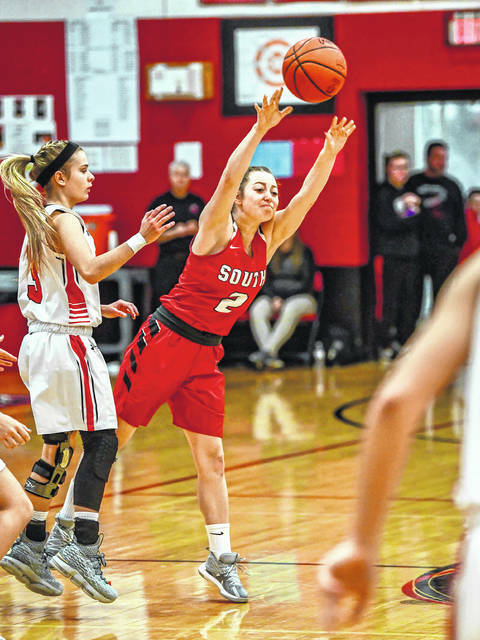 South is scheduled to play at Tri-Village on Thursday, Feb. 1. They will visit Brookville on Monday, Feb. 4 and Franklin-Monroe on Tuesday, Feb. 15. 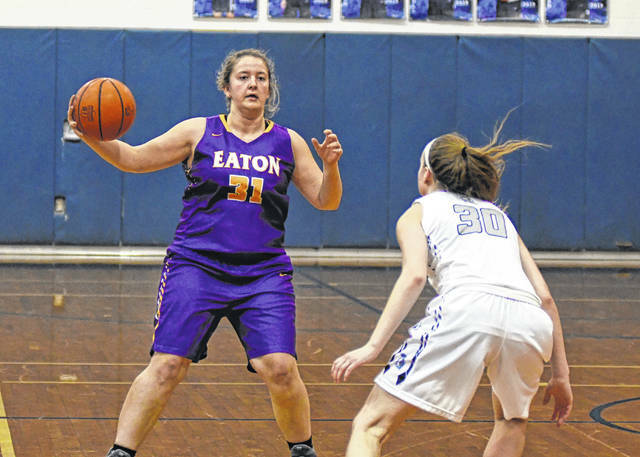 Eaton’s Anna Black dribbles the ball during the Eagles basketball game with Franklin on Thursday, Jan. 24. 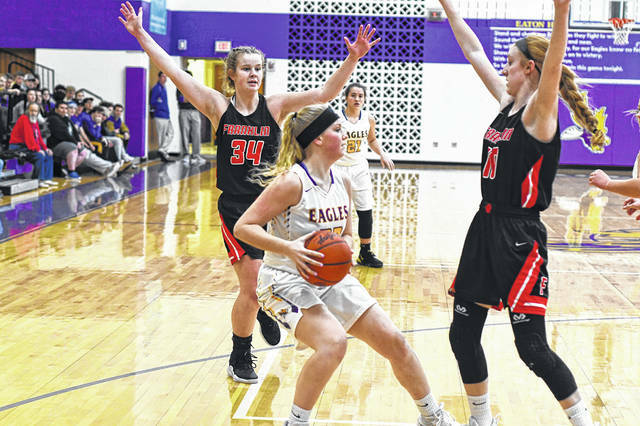 Black scored five points, but the Eagles came up short, falling 56-37.